In 2007, I took a break from working in the oilfield to ride my 2003 Kawasaki Z1000 around the US. I was on the road for about 3 months, and covered almost 18,000 miles, going through 16 states and 5 provinces (some photos from that trip are here & here). Before I was done with that trip, I felt the need to do another one, but bigger. And I knew I wanted to leave North America on that trip. Since then, I’ve been in Denver…slowly getting more and more settled, and not really realizing the extent of it. After taking a two week trip to Thailand with my friend, Grant, I realized that I needed to leave and see something different for a while. It didn’t take long to start thinking about this motorcycle trip that I’d wanted to do for almost 6 years now. I went through quite a few possible routes, eliminating many due to issues with border crossings, or countries I couldn’t or wasn’t willing to go through. My current route has me going through Europe, Asia, and Australia, then heading back to North America. And based on the planned route, I should have to take five major plane or boat trips (three to cross water, two for logistical reasons). People often ask what would make me want to make a trip like this. I guess the most basic answer is that I like the idea of traveling for an extended period, and I like riding, which I also believe is a fantastic way to travel. While spending a year flying from one place to the next would be a great experience, I like the fact that I will not be magically transporting (unless necessary for logistical or safety reasons) myself on a plane in between cities. Seeing the small villages, landscapes, and meeting people between what would otherwise be the major stops might just prove to be the best part. Good luck on your ride. Be safe be well and enjoy. So happy for you to be out living your dream! Wishing you well. Great site you have there! 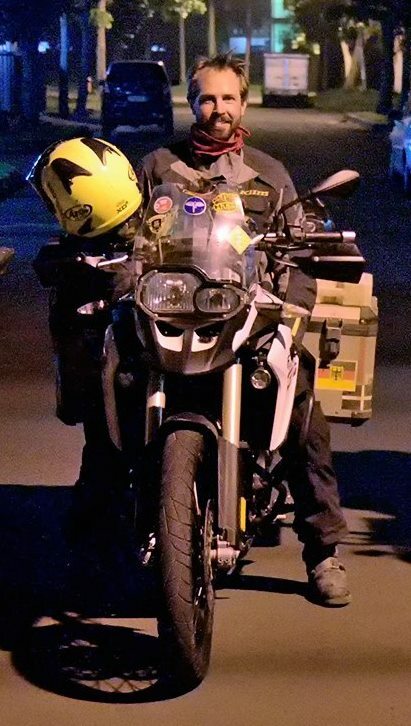 Found your photo of Laos on /r/motorcycles, am now epically jealous of and happy for you that you’re doing this trip. Best of luck, ride to Prudhoe, the Top of the World Highway, and White Pass above Skagway, AK. I’m starting to think about extending my trip a little and adding Prudhoe to the destination list….we’ll see though! I’ve seen your post around here and there. (Primarily Reddit) and I’m truly inspired by you. How much though process/work goes in to finding places to stay. Also, where does your money come from? Do you find jobs here and there? How do you pay for all of this? How much have you spent? Sorry, i know that was more than two Qs. But this is something id love to do. -Thanks for the time and inspiration! When I’m finding places to stay, if it’s in a town or city I want to spend a few days in, I usually do some research a couple days ahead of time to find a decent place. If its just a stop between destinations, I’ll typically just ride until I’m ready to be done for the day, then start looking for guesthouses in the towns I pass through. It’s worked out for the most part so far. As far as the money, I just worked a bunch for the past six years and saved a lot of money knowing that this day would eventually come. Hi. I’ve never done anything to get listed on Yahoo, so I’m not really sure how it ended up there. Could you send me a link of where you found it? Absolutely inspiring, Brother. Would be great to have you as a guest on my site sometime. Hope all is well out there. Thanks! I’ll check your site out as well! Pat, we were in the Rawhyde class together and I have been following your ride. Great Stuff! I am planning a trip to Hungary, Poland, Chec Rep and Austria next summer and was hoping to get some help on planning the trip; ideas, navigating, travel from US, etc. Anything you can provide would be great. Thanks and safe travels. Sounds like a great trip! Are you planning to ship your bike over there, or rent one when you arrive? Send me an email (sirrahtap@gmail.com)…I’d be happy to help answer any questions!